Yangtze River is the longest river in Asia and also the cradle river for Chinese civilization. Before your Yangtze River cruise in China, we will tell you how long the Yangtze River is, where it is, where its source is, what history and culture it has. So you could have a better knowledge about this great Mother River in this land and get a better and true experience when you are sailing on the river. Yangtze River or Changjiang River (长江), with the total length of about 6,397 kilometers long, is the longest river in china, and also the third longest river in the world, after the Nile River in Africa and the Amazon River in the northern part of South America. Originating from the Tanggula Mountain in the western China, Yangtze River runs from the west to the east part of the country, through Qinghai, Tibet, Sichuan, Yunnan, Chongqing, Hubei, Hunan, Jiangxi, Anhui, Jiangsu and Shanghai, finally flowing into the East China Sea. Yangtze River sources from the southwest side of the Geladandong Mountain (格拉丹冬峰) of the Tanggula Mountain Range (唐古拉山脉), which is at the eastern part of the Tibetan Plateau. The source is really wide and can be divided into altogether 3 parts, namely Tuotuo River, Tongtian River, and Jinsha River, with an average altitude of 4,400-4,700 meters, and total length of about 515 kilometers. Tuotuo River (沱沱河): the official headstream of Yangtze River, 374 kilometers long. It is covered with snow of about 10 meters thick all year around, with high mountains. Tongtian River (通天河): 815 kilometers long, is from the lower part of Dangqu mouth to the Bakuang River mouth in Yushu County in Qinghai province. Water runs gently and natural sceneries are majestic and pleasant there. Jinsha River (金沙江): covering from Bakuang River mouth to the mouth of Min River in Yibin, Sichuan, Jinsha River is 2,308 kilometers long. In this section, the famous and precipitous Tiger Leaping Gorge has an only 16km long river with 200 meters difference of water level, attracting so many tourists to enjoy. The Yangtze River Basin can be divided into three reaches, and they are the upper reaches, middle reaches and lower reaches, according to altitude of each part. The upper reaches are from the Yangtze River source (Tuotuo River) to Yichang of 4,504 meters long. It covers 70.4% of the total length of the river and has a very large fall of water. Among that, the section from Yibin to Yichang is about 1,040km long and is most referred to when talking about the upper reaches of the Yangtze River cruise tour. 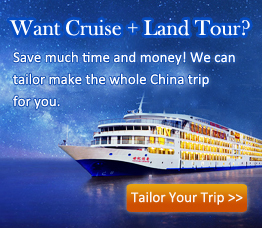 The golden section for the Yangtze River cruise is from Chongqing to Yichang, which is between Yibin and Yichang. This section is about 40 meters above the sea and about 320 kilometers long in total. Since it is the essence part of the cruise tour along the great river, you will encounter with a series of interesting attractions and fabulous landscapes. Major cities & sites: Chongqing, Fengdu Ghost City, Shibaozhai Pagoda, White Emperor City, etc. The section between Yichang city and Hukou county in Hubei province belongs to the middle reaches of the Yangtze River, with a total length of about 955 kilometers and a drainage area of 680 thousand square kilometers. Since there are many tributaries in this part, the watercourse there is really complex. Major cities & sites: Yichang, Three Gorges, Three Gorges Dam, Shennv Stream, Shennong Stream, Lesser Three Gorges, Tribe of the Three Gorges, etc. The lower reaches of Yangtze River refer to the part from Hukou county to the marine outfall in Shanghai, which is 938 kilometers long and a wide area of 120 thousand square kilometers. In this part, the Yangtze passes many prosperous cities like Shanghai, Nanjing, etc., witnessing the growth and development of the economy, culture, tourism, and other aspects of those popular places. Major cities: Shanghai, Nanjing, etc. As Yangtze River is so long, across a wide range from the western to the eastern part of China, this basin has multistep landforms. If you have enough time to travel along the river, you could enjoy the mountain land, plateau, basins, hills, plains, and so forth, watching the Qinghai-Tibet Plateau, Hengduan Mountains, Yunnan-Guizhou Plateau, Sichuan Basin, Jiangnan Hilly Regions, the Middle-Lower Yangtze Plains, etc. The various landforms enable China to possess so many rich kinds and amazing landscapes to see. Since Yangtze River is abundant with water, the basin is the great growing place for multiple plants and animals. The forest cumulate quantity in this area covers about one quarter of the total amount in China. And it has the most economic forests throughout the country. Besides, a large number of animal species live harmoniously there, and some even are special types only can be found in the Yangtze River Basin, such as the giant pandas, golden monkeys, white-flag dolphins, Chinese alligators, etc. The Yangtze River shaped during the same time of the Jurassic Period of 140 million years ago, when the river was running from the east to west edge into the Tethys Sea. As the strong movement of the Himalaya Mountain range and other crustal changes of this area, the western part gradually became higher than the eastern part, so then the Yangtze River changed its direction into the east edge as now. Later at around 2 million years ago of the Old Stone Age Period, the human being made their activities at the area of the Yangtze River, which was demonstrated by the human fossils unearthed there. For decades, from the Spring and Autumn Period (770-476 BC) in ancient China, there were many kingdoms with the Yangtze River being the boundary. Those kingdoms all wanted to unify others to be the strongest and larges one, so the Yangtze has witnessed many chaos and wars for so long time. Then, after the unification of the whole China by the First Emperor of Qin, the whole state was in a much peaceful atmosphere. However, as the transportation and communication were both short in the area of the Yangtze River in ancient times, people in Ming dynasty started to build a bridge in Nanjing city and that brought a new change of the history of the Yangtze River. After the construction of the bridge in Nanjing, many other bridges were completed one by one in major cities along the river, which benefited the transportation, communication, business, and development of those cities. As the techniques and economy improve a lot, the Three Gorges Dam and the Gezhou Dam projects were both built successfully to solve the flood, drought, dangerous water situation, aviation shortage, and other problems along the Yangtze. So now, after the non-stopping effort of Chinese people, the Yangtze River is more and more famous, and attracts countless visitors from various countries and regions to appreciate the charm of itself and the appealing coastal cities. Also, it is now the busiest river for good shipping in China. Yangtze River, as one of the two Mother rivers in China, is the cradle of the brilliant Chinese culture for so many centuries. And it contributed a lot for the origins and development of the “Bashu Culture” in Sichuan, “Jingchu Culture” in Hubei and Hunan, and “Wuyue Culture” in Jiangsu, Zhejiang and Shanghai areas. In Sichuan area, you would know what really the “Land of Abundance” is with the fertile resources, so delicious food, and many famous attractions. In Hubei and Hunan, there are rich culture features to savor and interesting stories of ancient celebrities reputed by domestic people from one generation to the next. In Jiangsu, Zhejiang and Shanghai, a lot of tasteful dishes are waiting for your try and you would know the real “Heaven on Earth” with visiting to the antique water towns, classic gardens, and cool life colliding with the prosperous life in those large cities. Traces of the ancient culture of Yangtze haven’t gone with the fast development of the cities along the river. Rather, the local people keep trying to maintain those precious relics to show and record what have happened there in the past. Another kind of important cultural relics is the trestle road along cliff. The ancient Three Gorges trestle road along the cliff is about 50-60 kilometers in total. According to the historical materials, the trestle road was wide to let carriages and horses go through, but it became narrower under the natural weathering. And now, as the level of water of the Yangtze River at the Three Gorges part rises up due to the water storing of the Three Gorges Dam, the trestle road is submerged under the water. Yangtze Cruise Upstream or Downstream?